A day long state level sensitization workshop on Agripreneurship development for increasing farm income and promotion of agri-business in Manipur was held at Indian Council of Agricultural Research (ICAR) Imphal centre on Tuesday. Vice Chancellor Prof M Premjit of Central Agricultural University, Eroishemba Imphal was the chief guest of the sensitization workshop which was organized by Agri-Business Incubation (ABI) Centre ICAR Research Complex for North Eastern Hill (NEH) region Manipur Centre. 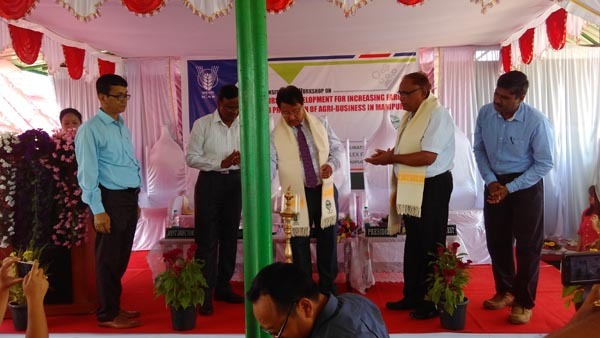 General Manager PN Praveen Kumar of NABARD, Manipur Regional Office Imphal and Director N Prakash of ICAR Research Complex for NEH region, Umiam, Meghalaya also attended the inaugural function. Addressing the workshop which was attended by many agri-entrepreneurs from various places of the state and scientists, Prof Premjit expressed the need to replace the conventional forms of rice cultivation into a mechanized farming by using the high yielding rice variety and integrated crop management etc. Informing that the system of rice intensification (SRI) mode of rice cultivation will double or triple the net profit than the conventional form of rice cultivation which in average gives a net profit of Rs 12,000 to 14,000 per hectare in the region. The Vice chancellor of the largest agricultural university which has 13 colleges under it across the North Eastern states also asked the concerned implementing agencies to focus on the unemployed youths of the region while imparting the necessary training programmes for the Agripreneurship development. Highlighting the success rate of farmers training programmes of the university in fishery and livestock production, he opined that such move can help in getting better success rate. He however advised to conduct impact analysis of such training programmes in future. General Manager PN Praveen Kumar of NABARD while delivering his speech in the day’s gathering highlighted the prospects and importance of getting bank loans and other important banking areas for the farmers and enterprenuers. Director N Prakash of ICAR Umiam also spoke on the occasion. Earlier Principal Scientist Dr G Kadirvel who is the Principal Investigator ABI, ICAR Research Complex Meghalaya delivering the key note address, said that the programme was organized in Manipur considering the strategic location of the state,s kill manpower, human and natural.